Replies: 54 (Who? ), Viewed: 102022 times. #1 10th Mar 2006 at 10:08 PM Last edited by leesester : 9th Feb 2012 at 8:42 PM. This is, essentially, part four in my series. If you know how to recolor, recolor selectively, and add textures, here's where we start to have fun. 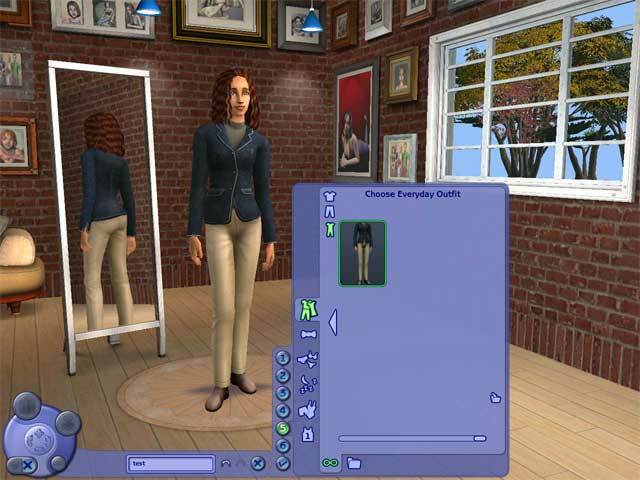 By coloring or texturing on your basic mesh shape, you open up brand new clothing possibilities for your sims. Here we have a truly hideous outfit. Has anyone actually used this in game? It’s all the way at the end. However. . .we are not bound by anything except the general shape. In Body Shop, select this ugly thing and load it as a project. In Photoshop, open up the texture.bmp file, and fill it with a solid color so we can see what we really have. viewing angle, right mouse button to change to zoom. And. . .here’s the back. The first thing I want to do is change this from a stodgy old mock turtleneck into a see-through lacy top. This is the part I want to modify. . .but not here, in the alpha file!! I’m going to skip a couple of steps here. I have a picture of some lace that I copied and pasted onto itself in a new window in Photoshop until it was big enough to scale down to proper sim-size (as shown in my last tutorial, Adding Texture). Now I have taken my texture.bmp file, desaturated it, selected the whole thing and copied and pasted it onto the alpha file. I then used the polygonal lasso to select only the turtleneck section. I apply a mask, revealing only the selection. Now I have the section I want to change in the alpha positioned to correspond with the same space in the texture file. I take my lace picture, desaturate it, fiddle with the brightness and contrast, then sharpen the image so it makes a nice black and white texture to go into the alpha. Remember, anything that’s white will show, anything that’s black won’t, so all those black areas will be skin showing through. I do the same thing at the back neckline of the outfit. Now, you can see at the back, the pattern inserted into the alpha file has created a pattern of opacity and transparency. 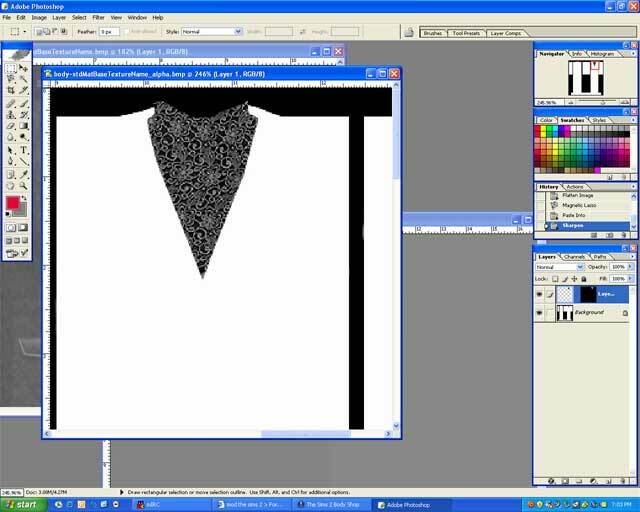 I went into the texture file and filled the turtleneck area with a solid red to show what happens when you add color! If I were really being a stickler here, I would fix that stretched area at the back neckline, but right now I’m figuring that the best fix for that is. . .long hair. 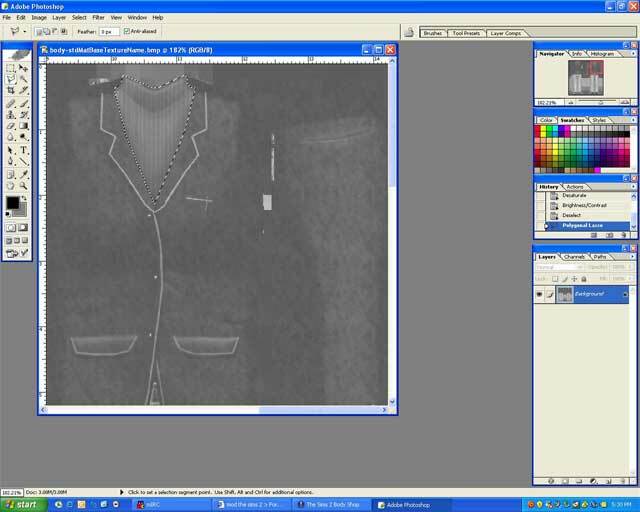 Now, I took another fabric texture and filled in the jacket in the texture file. I changed the opacity so I could see the original lines of the outfit, used burn and dodge to highlight lapel and pocket edges, and create a new line – princess seams and a straight zip front. This is looking better already! Now it’s just a matter of recoloring the pants and shoes, and we have something completely different! As you can see, you don’t necessarily have to change a mesh to change the outfit, and this kind of artistic license will also teach you how to use the tools of your image editing software. 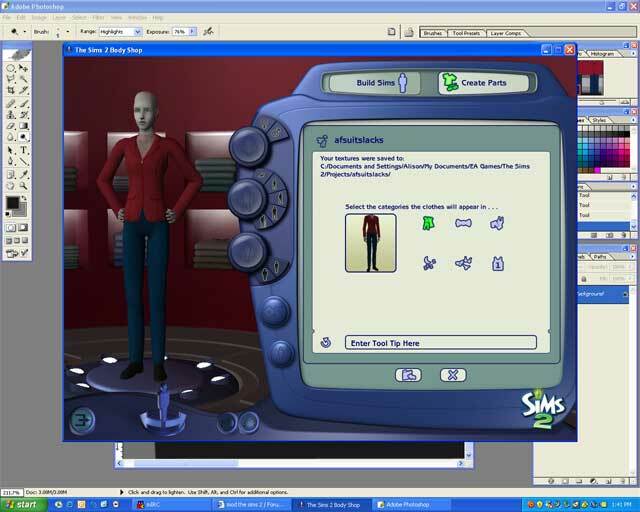 i have a sims2 fansite.. it iswww.freewebs.com/bella1234200.. feel free to have a look... there is a chat section as well. Very nice tutorial. Where did you get the lace pattern? Wait... I bet my question has already been asked and answered. If you finish up by importing to the game, your stuff will show up. Did you read through all the tutorials before this one? This message has been deleted by Faylen. Great tutorials. 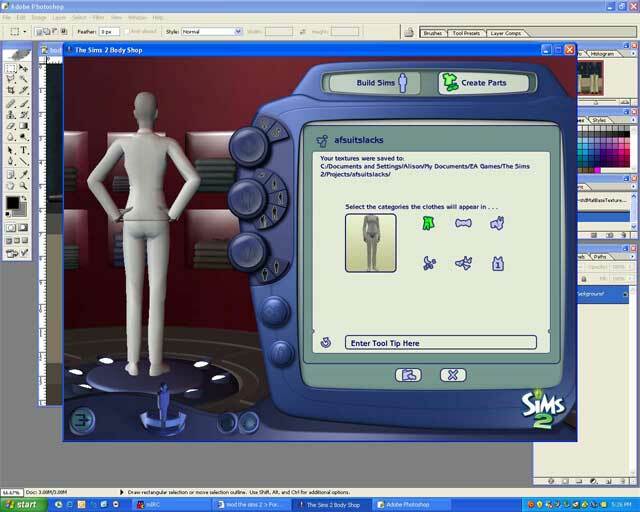 (all 4) I learned everything I ever need to know about modding sim clothes, all in 3 hours. P.S. Does anyone happen to know why some clothes export a third texture, called "normal" instead of "base", and why others only have the base texture and the alpha? That is the bump map. It creates an additional 3D effect, and isn't used in all the clothes. On some of them, it creates the texture of the fabric - enhancing the rib knit of a sweater, making lapels stick out more, etc. If you have a bump map and the shape it creates is incompatible with the shape you want to end up with, just fill it 100% with grey. Constructive critique appreciated. It'll help me learn. Faylen, I have now read all four of your tutorials you have written for us about recolouring. Before I read any of your work, I was too scared to even try to recolour but I must say that your guides are so clear and concise that even an old fool like me can have a go. I'm thinking you must be a teacher of some kind. Thanks a bunch. TexasDawn, that's lovely, especially for a first effort. Don't get discouraged or put yourself down - the more you do, the more you learn, and the better you get. There are a lot more tutorials here that will enhance your skinning abilities. There are tools galore in the programs you already have, and you might find that some process-oriented rather than goal-oriented playing around will be really fun and helpful. You can do a lot of playing without breaking anything, so go for it. 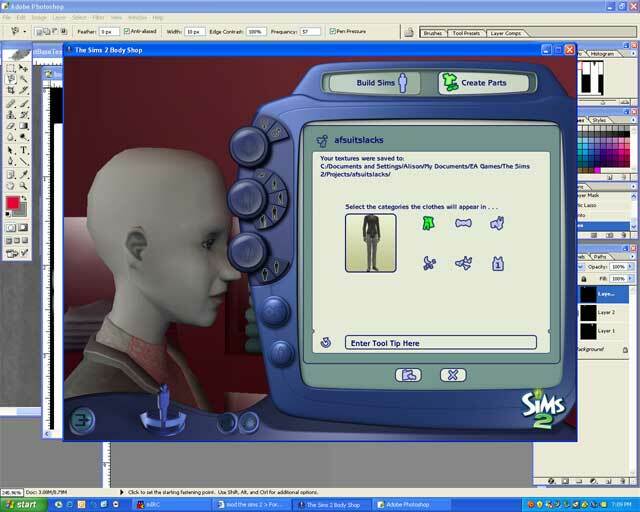 sims2hohner, actually. . .yes, I am. Heh. This message has been deleted by Faylen. Reason: Help yourself. That's what this site is about. some of my Creations, good and bad! anyhow since texas dawn put up some of her things up i thought i might do to!!!! Do you think PhotoShop Album or PhotoImpression4 might work with this? I'm not familiar with either of those, but the key questions as to whether or not they'd work are 1. do they handle layers, and 2. can they save .bmp format files? Would the free PhotoShop downloads be safe? Photoshop is a commercial program. You could probably buy an OLD version of photoshop (say photoshop 5 or 7) for a good price on ebay or such. 'Free Photoshop' meaning some site offering warez - well, safe? You tell me, they're pirates. No one here will ever tell you to go get pirated software. If you check the FAQ for the area, there are links for paint.net and gimp, both of which are FREE image editing programs, simply free, no illegal activity involved. This site currently has some tutorials for paint.net which cover the same things as some of Faylen's tutorials... keep looking around. At the part where you said "The first thing I want to do is change this from a stodgy old mock turtleneck into a see-through lacy top. This is the part I want to modify. . .but not here, in the alpha file!! I’m going to skip a couple of steps here. I ..."
when you said about skipping, I wish you didn't. I need those steps, ^^ and I can't fined the other tutorial, since this is a re-post. Can you give me the link to the tutorial? or those steps? Thank you! I would be so lost without your tutorials. What did you use for the jacket? I didn't find anything except photos of real fabrics. If you used a photo of the real fabric, what did you do to it first? Because when I use them they have ugly lines between them. I can fix them with other pictures but these are very hard. Thank you very much for tutorials! Thank you SO much Faylen - I have trouble downloading - stuff just doesnt show up in my game, even if I follow a downloading tutorial!! So it was my lucky day when I decided to follow your tutorials! I am now recolouring everything and love it! Thank you again and keep doing tutorials for those of us that need a little extra help! 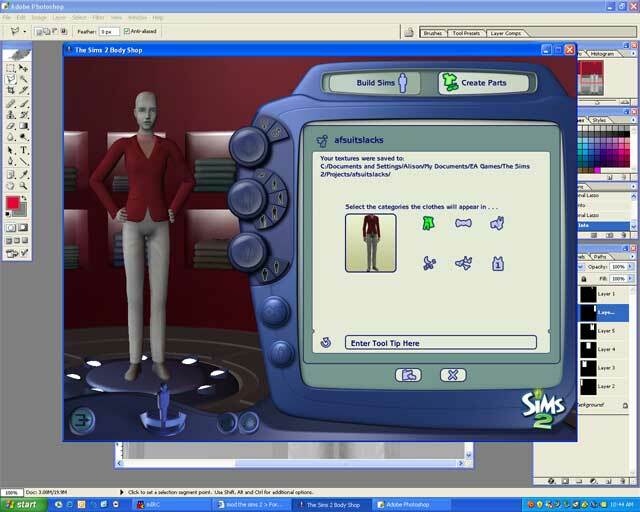 Hi, I really want to learn how to make clothes for the sims, but I don't understand how to work with Adobe Photoshop.. So I don't get any further... can you please tell me how to do this? Thank you!! #23 5th Mar 2007 at 3:18 AM Last edited by purplerainsim : 6th Mar 2007 at 11:13 AM. Well I have done the first 3 tutorials I have had some good creations which i will share and bad ones which i will also share. The last one is the one that is really giving me trouble. I was trying to add lace to the outfit. as you can see there are gaps ,and on the back there is some color showing up from when i was trying to change the tunic color.I followed the instructions but i must have missed a couple steps. The pants where me playing around with filters and thought it was pretty funny. Edit: How do I get rid of seams or lines down the side of an outfit? Well, I have problems with finding fabrics and laces online that I can utilise, but then again - I've been at this for what? A few hours? I will figure it out. 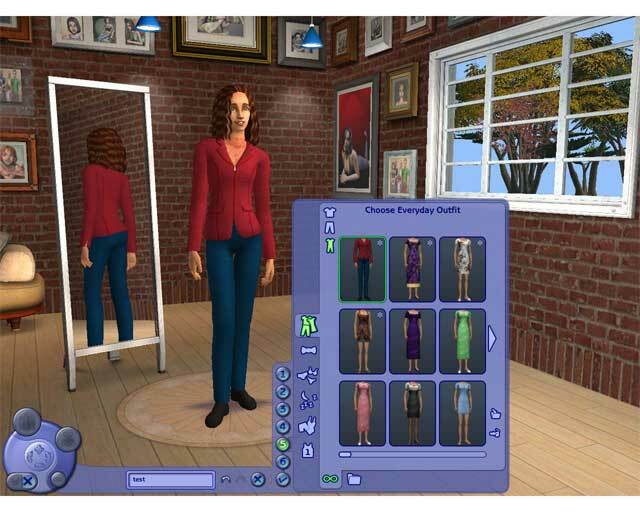 This is what I made using the first couple of tutorials... three recolours of one of the sims2cri maternity dresses that I didn't think much of before (and I know the red one isn't optimal yet either) and a set where I'm particular proud of the picture on the sweater. Hello, I just wanted to say that I think mizzkitty's creations look very groovy!